This simple, straightforward resource book has been prepared for two basic reasons: one reason stems from my belief that every society has a great deal of practical and useful knowledge which is often expressed most creatively and effectively through the tales and toys of that society; the other reason is based on my own experience with self-made simple toys. This gave birth to my interest and fascination for design, science and technology. Today we find children and their parents are obsessed with glossary, high-priced, factory-made toys, perhaps not realizing what a child can gain from simple self-made play-things. A few words on how this book was developed. It began with documentation of what I remembered about playthings I had made and played with during my childhood. Next I started a regular interaction with neighbourhood children. I often invited them to my house and made them play with new toys. The children in turn showed me things that they and their friends made and played with. The other source of information I drew upon was my students and faculty colleagues at the National Institute of Design (NID). Being a national Institute its students and faculty staff are drawn from all over the country. They were able to provide information on the toys children made and played with in their respective regions. Craftsmen and artisans, who came for training programmes at NID, provided the impetus to ideas on the playthings that were popular in their areas. This process of interaction with children, with my students, faculty colleagues and craftsmen, went on for about four years and a good resource was built up during these years. The information collected covered the toys children made and played with throughout the country, not only today but even a generation ago. I also had interesting discussions with designers, scientists and educationists. Their views, often divergent, helped me in shaping and processing the material collected for the book. 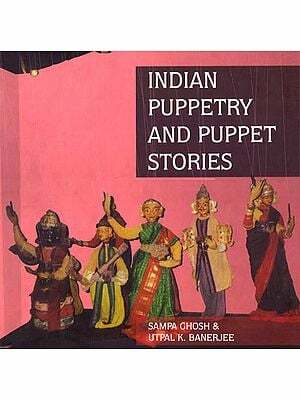 This is a revised and redesigned edition of the earlier book titled Joy of Making Indian Toys, first published in 1992. The best thing a child can do with a toy is to break it, the next best he can do is to make it. 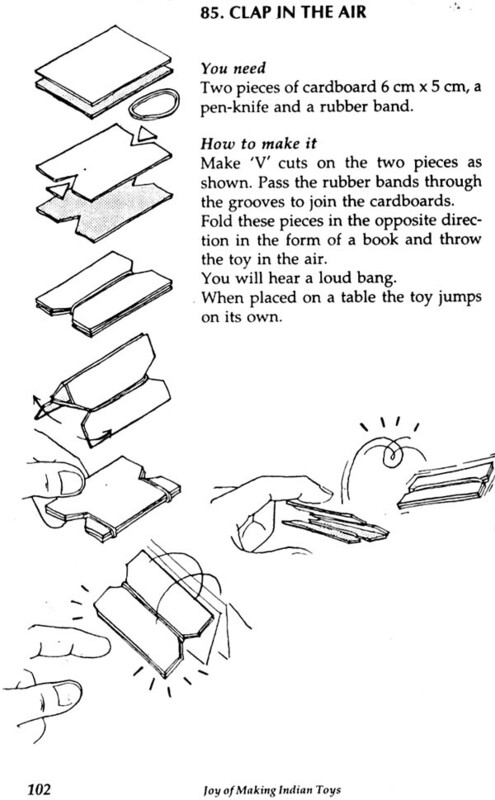 This book is on toys which children can make and break freely. The low-cost or rather no-cost toys are the everyday playthings used by million of children today as also in the past. The fact that these toys cost nothing and are made of the simplest materials, often that is recycled, does not mean that they are inferior to the high-priced, factory-made, easily available on-the-shelf toys. In all possibility these handmade toys have an edge over the commercially produced playthings. You may ask how it is so? Let us read further to find out this. One of the unique features of these toys is that they introduce children to a scientific method of working. In the process of making and playing with these toys, their faults and shortcomings can be realized easily. This is so because, unless the toys are made according to certain specifications, they will either not work at all or work improperly. Children on their own can make changes and remove the shortcomings, if any. For instance, when a paper whistle is made and no sound emanates, children become curious and wonder: is the construction right? Is the way of blowing correct? Is the selection of paper appropriate? This way the children are introduced to the basic ideas of 'experimentation' and 'creativity' in a subtle yet effective manner. The toys shown in this book are made by the children themselves. They may have learnt these either from their peers, or from older children or from adults. In the process they tend to share and learn. At times, guidance may be sou8ght from elders on how to make and play with the toys. Is would be fair to say that no other type of toys can introduce children to the basics of science and technology so effectively as these handmade ones. A child effortlessly gets exposed to the principles of science, particularly those of physics (details are given in the appendix). It may be argued that the fundamentals of science can be explained by means of scientific equipment and appliances and also through examples from our own environment. So what is special about knowing science through these toys? 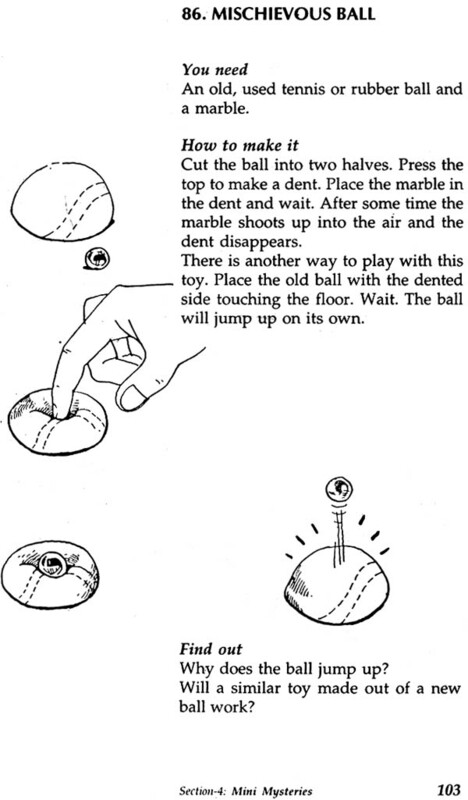 Well, these toys, being simple to make and easy to play with, provide a clearer concept of science. Learning becomes a part and parcel of the play and a joyful experience at that. You will come across the helicopter under Section 3. This is made of a wooden ruler tied at one end with a piece of string. It does not look like a helicopter. But wait. Hold the free end of the string and swing the ruler in the air. Something unexpected happens: a strange growling sound emanates as that of a helicopter approaching. A child is bound to be curious about how a simple ruler can generate such an unusual sound. Plan and construct step by step; work with common basic tools such as use a variety of materials and thus get familiar with their properties; understand the basic concepts of measurements and the need for accuracy; appreciate the part and assembly' concept, i.e. 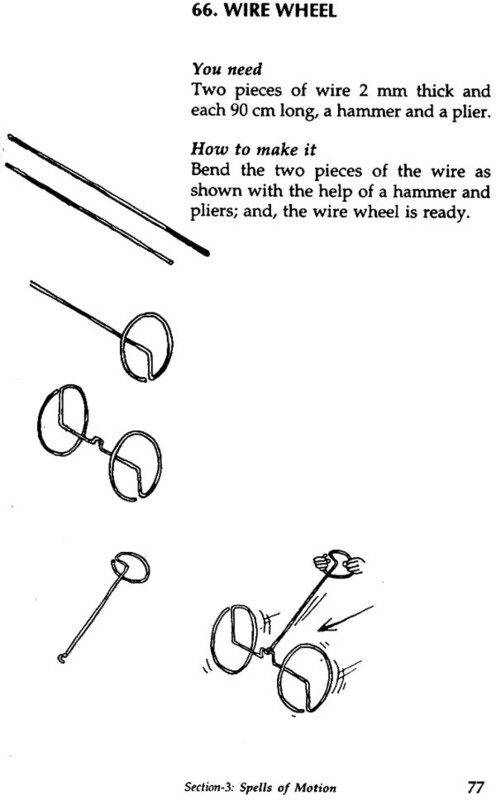 how an object having more than one part is made by assembling parts which have been made separately; and evaluate the work done and judge the scope for improvement. Take the case of the windmill toy under Section 3. The aim is to make a playing device which can rotate by wind energy. This toy is developed by selecting the right materials and through appropriate structural construction. Let us suppose that the paper used for this windmill is took thin or too thick or the paper blades are not in balance or do not have the correct type of folds. Will this toy work? 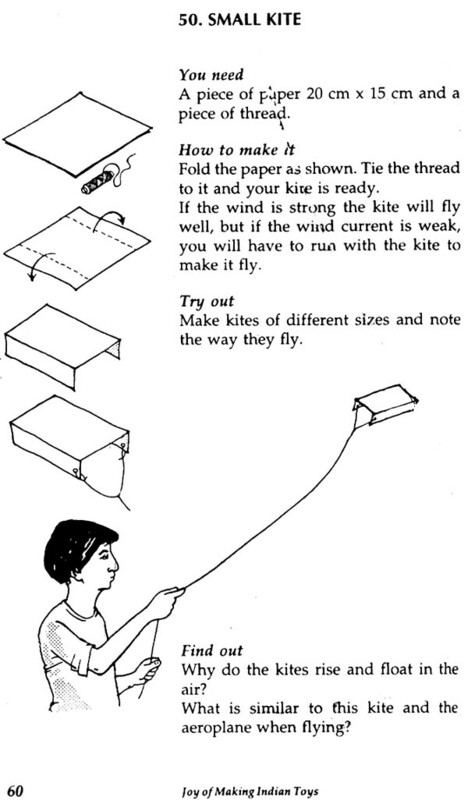 Likewise, how does a new user know that this toy would rotate against the wind current? Does the form indicate this? Very often children paint colourful rings on the blades to perhaps indicate rotary action and to enhance the visual appeal. There are also toys, which tell us something about 'design and nature'. For example, the ant and the fan machine in Section 2. As part of its design construction, a stick is inserted in a hollowed rubber-plant seed. On studying this seed-shell, no cut or breakage is visibly apparent. How is it that the inside matter was removed from within the seed without any cut on its shell? Well, what follows may seem like a fairy-tale. 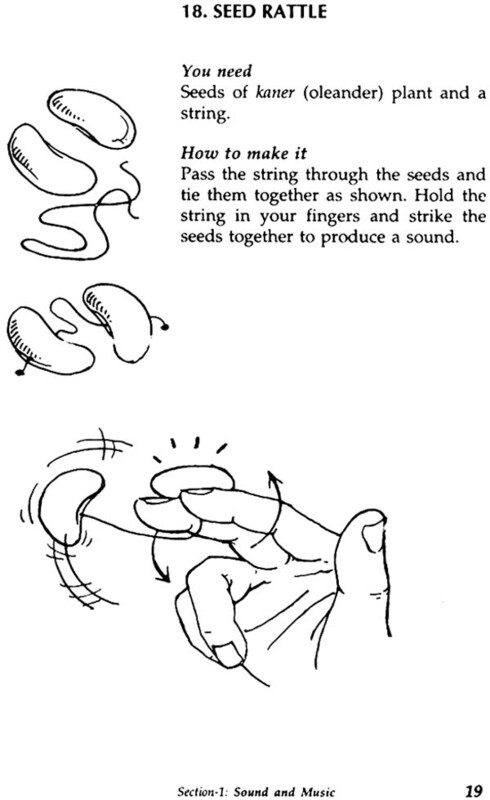 A child gets hold of a rubber-plant seed, and leaves the seed at an anthill for a day or two. Ants eat up the pulp within the seed and create a hollow. The child then collects the hollowed shell. 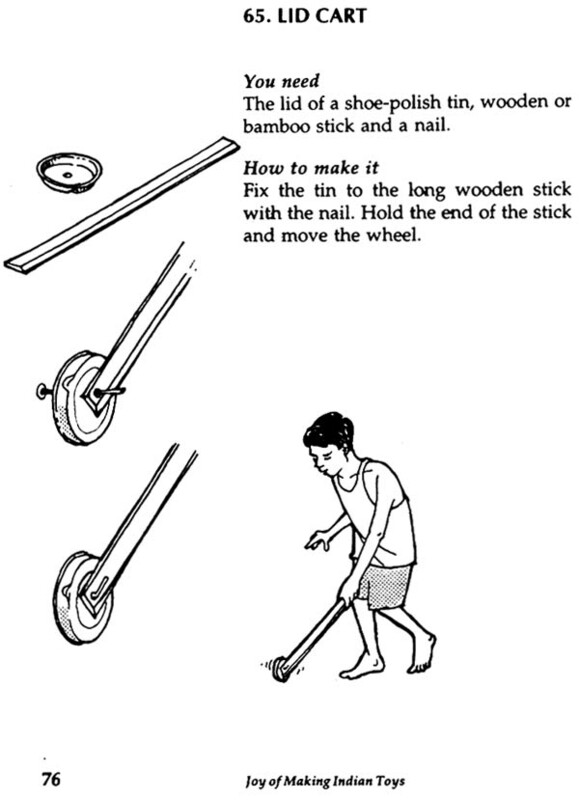 This is something commonly done by children in Kerala state, where the toy is very popular. Is it not fascinating that 'common' people find out the most 'uncommon' and imaginative design solutions! There are some other toys, which familiarize a child to the innovative aspects of design science. One such example is described under Section 4. it is called the 'sewing machine'. 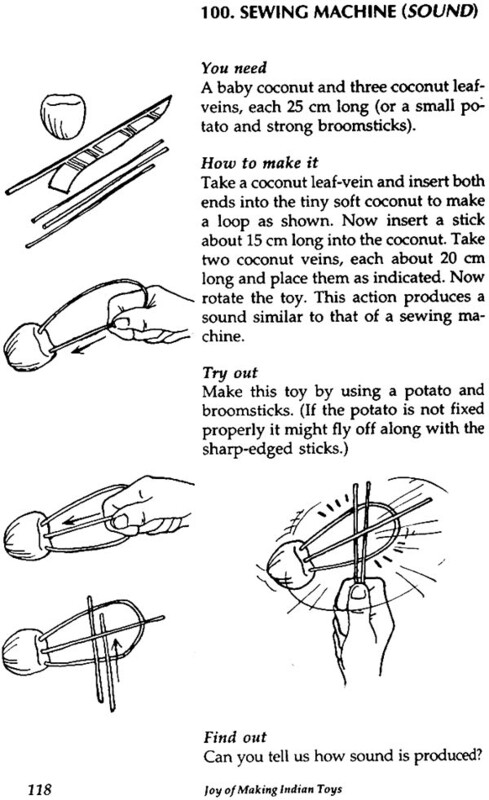 This toy is extremely popular in the south where coconuts grow in abundance. The toy makes a slight 'tik-tik' sound, much like a real sewing machine in operation. But there is another ingenious feature added which makes it still more interesting. 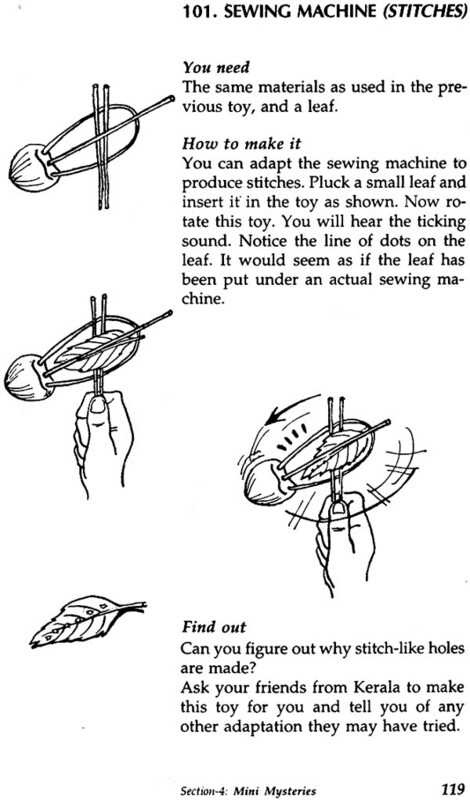 A green leaf is placed in between the sticks and the toy is rotated. A new phenomenon is the displacement of the leaf and its falling down. On examining this leaf, small holes are seen. These holes look exactly like stitches, as if the leaf had been placed under the pressure foot of an actual sewing machine. Some questions commonly asked are explained in detail in the following paragraphs. These toys are relatively safe considering the Indian home environment. 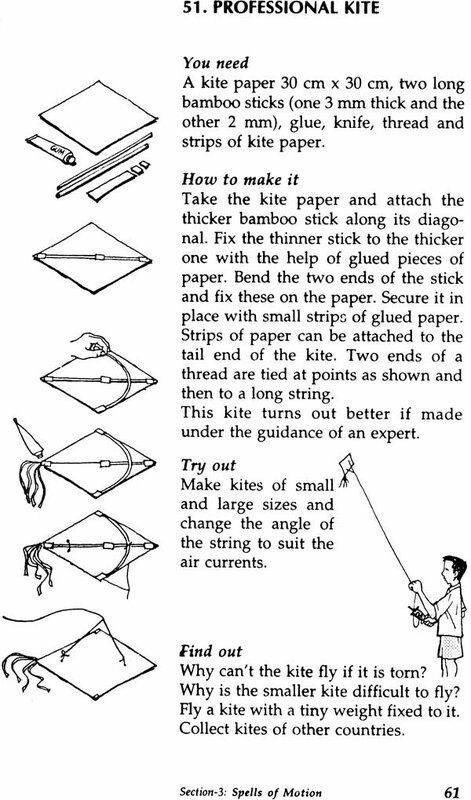 Children usually make these from discarded materials by using tools such as knives, scissors, needles, etc. at what age should the child be allowed to handle these tools? Are these tools risky? On the contrary, the making of these toys provides an opportunity to handle materials and tools by taking adequate precautions when working. This is an important aspect of growing up. However, in the making of certain toys there is always an element of risk. 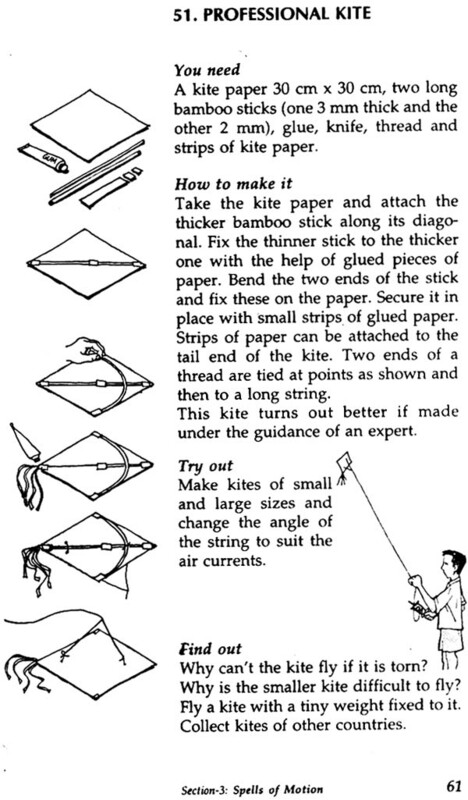 For example, there are toys, which involve the use of a razor blade or bows and arrows. Here teachers and guardians need to warn the child against accidents, yet encourage him/her to handle tools with proper care. Are these toys specifically Indian? The answer is 'yes' and 'no'. 'Yes', because these toys are indigenously made, and 'no' because many similar concepts on these toys exist in other countries too. For example, a 'wind wheel' is made and played with by children all over the world. But, the 'mango seed fan' or the 'sewing machine' is typically Indian it is a fact that no other country apart from India has a wide range of such toys. But also for other utility items like baskets, earthen pots, textiles, etc., which are all made by hand. The other special feature is the use of recycled and discarded material, which is quite common to Indian culture. The rich, diverse environment provides a wide scope for development of new concepts and ideas. These toys support the view that creativity, innovation and technical knowledge can be part of even those people who do not have any formal education or training. Lifestyles have undergone a change, giving birth to new social themes and technologies. Used battery cells, electric wires, film rolls, reels and bobbins, tape spools, plastic package containers, plastic film sheets and bags are discarded everyday. These can be reused to generate new ideas and new toys. Who can develop these no cost ingenious toys? And what will be the role of trained scientists, designers and educators? After all is said and done, the most important aspect of these toys is the experience of joy and the element of creativity. These handmade toys are in reality the forerunners of would-be scientists, engineers and designers. 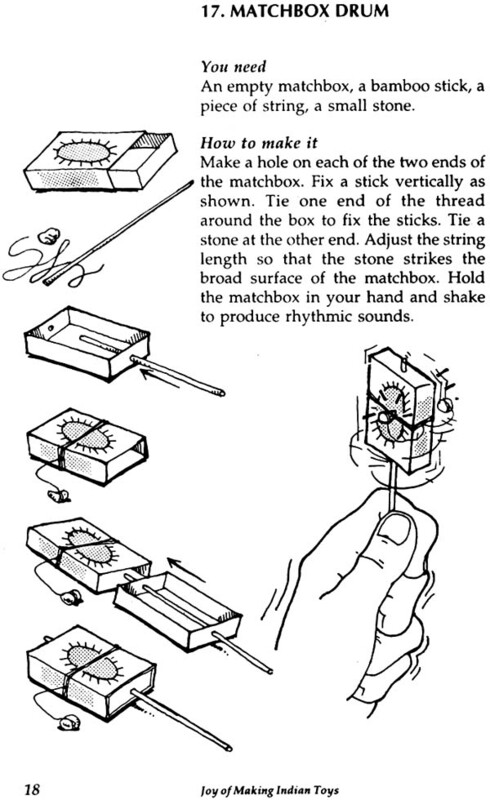 We hope that the simple, ingenious toys documented here will help to inspire many. This book indeed is a tribute to the genius of those 'ordinary' people who thought of and gave shape to 'extraordinary' playthings that can be prepared at no cost and with no special effort. In case any difficulty is encountered while making or playing with a toy, remember not to give up or get discouraged, but, try, try again! This is a simple activity book meant for children as well as adults. Children make and play while adults help and guide. The 101 hand-made toys documented inside are the plaything made even today in various corners of the country and at practically no cost at all. Besides providing hours of fun, this activity book helps to instill confidence by enabling children to create their own toys with their own skill and ingenuity. Is it not surprising that such small, ordinary playthings have something to do with design, science and technology too? Sudarshan Khanna is designer and educator at the National Institute of Design, Ahmedabad. His other books, Dynamic Folk Toys and Toys and Tales have been acclaimed by educationists and designers as pace-setters. He is recipient of NCSTC-DST's 1995 National Award for science Popularisation among Children. He is on the board of the International Toy Research Association and has conducted several workshops and exhibitions as various aspects of Indian toys and toy makers.